just up the pike: learn about flower theatre, eat great food at discover long branch! learn about flower theatre, eat great food at discover long branch! 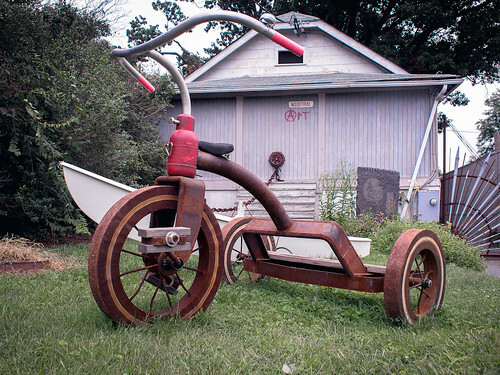 One of artist Howard Connelly's giant tricycles, shown here in Colesville, will be on display at Discover Long Branch! Photo by Andrew Benson on Flickr. For some, Long Branch is just a pass-through on their way to Silver Spring or College Park, but the neighborhood has its own unique culture and great local businesses. You'll get to learn more about the area and have a great meal at the first-ever Discover Long Branch! event next week. Nearly four months ago, I organized a charrette or design workshop exploring possible futures for the Flower Theatre, a 1950's-era Art Deco theatre that was an anchor of Long Branch for decades. Since then, the newly-organized Flower Theatre Project has compiled a report of social and economic conditions affecting the viability of reopening the theatre and held a few meetings with community leaders and the property's owner. The Flower Theater Project's next step is to reach out into the broader community, in the hopes that a stronger neighborhood and local economy will draw the kind of investment needed to bring the Flower Theatre back to life. We've been reaching out to the Long Branch Business League, a group of local business leaders, which is organizing a series of Discover Long Branch! events to raise awareness of the area and its businesses. Their first one will be held Monday, December 3 at El Golfo Restaurant, located at 8739 Flower Avenue, from 6 to 9pm. The Long Branch Business League and Montgomery Housing Partnership (MHP) are initiating a series of events, called Discover Long Branch! The events offer both spectacle and specials. At each Discover Long Branch! event, beginning in December, customers will get the chance to personally meet the owner, enjoy special discounts and be entertained by innovative arts and music in the eclectic neighborhood whose boundaries include Piney Branch Road between Flower Avenue and New Hampshire Avenue. El Golfo will offer customers a 25 percent discount on its famously diverse Latino food (which also extends to less typical Latin fare, like excellent chocolate mousse). For children of all ages, there will be a giant (8-foot tall) tricycle to ride, weather permitting. The giant tricycle was created by local sculptor Howard Connelly. There will be other artistic attractions as well. The series is part of a larger community revitalization effort being spearheaded by the newly reformed Long Branch Business League in partnership with MHP and a wide variety of other local non-profits, artists and arts organizations. If you're interested in the future of the Flower Theatre, I encourage you to come out. I'll be there along with some folks from the Flower Theatre Project. We'll be talking about our report and some of our goals for the future. It's also a chance to visit an awesome Long Branch restaurant and try some great Latino food (I am partial to their quesadillas, though I'm told their chocolate mousse is also amazing). For more information about the event and Long Branch, visit the Business League's website or email their contacts, Carlos Perozo and Paul Grenier. And if you'd like to learn more about the Flower Theatre Project, please visit our webpage. Read the report. I'm not so sure about the disposable income the authors are talking about. I used to live down the street in Langley Park and the neighborhood isn't that different. Lot's of renters in rented units and owned. It pushes up household income. Its kind of silly, the premise I got from the beginning was these people have a lot of money left over after bills and no place to spend it. Sure. Anyway the food marketplace was a good idea. I don't know why you would have to have place to sit down and eat though. Take out. I'd be nice to have Lexington market, good local and visitor draw. The movie theater again idea is good. The competition would be a problem but to set it apart and since it is only one screen just make it a IMAX (true imax if it will fit) Not to many of those around. Especially if its full size, there are none that I know of in the metro area. Just the Smithsonian and that doesn't play commercial flicks often. All the other ideas I'm sorry to say just don't seem to sit right for that specific neighborhood, they seem more geared to focus on bringing in outsiders and don't play much to residents. Dec. 13th at 7pm in the Civic Building. There are 3 public Meetings in December for new developments in Fenton Village, this is our golden opportunity to understand the changes and voice opinions. If you want to have a say in the future of Fenton Village then come out for about an hour and see what the developers have proposed. This is a public process and will be part of the development record on these projects. The Developers have to record your comments - you can speak to the height, massing, appearance, parking, density, use, etc. You can also see three different developments and compare the different approaches of the different development teams. You can hear your neighbor's opinions and concerns as well. If you believe that Fenton Village needs to be developed in a manner supported by the local community - then please come out and be part of the process. On Bonifant, adjacent to the new library, where the vacant lot is currently. This is the public unveiling of this project. It is proposed to be 8 stories, 110 residential units for seniors - affordable. Street level retail. It has yet to file for Project Plan review. (B on the attached map). Most of the new developments are market rate apartments geared for young professionals. This is a project that is geared for seniors - which would mean Silver Spring would be a more balanced community in regards to age.